Mina was the Worst Dog on the Planet this morning during training. Okay, she wasn't that bad. She lunged like a ninja warrior at another dog. The frustrating part was that she remained keyed up the remainder of training. She kept staring at every single dog waiting for one of them to stare back so she'd have an excuse to lunge. I remember the early years: flipping out on lead, snarling, doing somersaults, barking, acting like a social reject. She's progressed - she doesn't bark or snarl or do somersaults. She still stares like a stalking lioness and if I don't redirect at the right time, she'll lunge on her lead. Training has been really great this second time around. This is the 4th session and she's done marvelously the first three classes. So I guess she's allowed to spark off every now and then. But the dog she sparked off on? Ernie who is, by all definitions, sweet and doofy. In fact, he has a very similar personality to Labrador Retrievers which may explain Mina's aversion to him (she's always been a big fan of chasing and yelling at Labs). 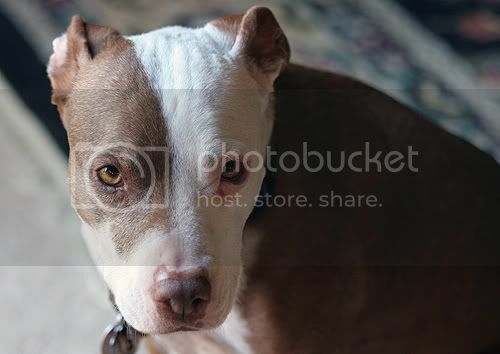 I still need to get a picture of Muffin who lives up to her name and who I consider the 2nd cutest patchy-eyed pit bull. Anyway, Mina is not pleased by my besmirching of her good name. aaaaaaw. :( poor mina. i hate those days, where you feel like you're just kinda gunning for a fight. here's hoping she feels better later. Terrier give the best looks ever! Sorry she was a bit sucky. I hate those days. Even though a lot of progress has been made those days still just get you down. And the owner of the dog lunged at just cannot understand how much work as already been done and how much better your dog is now.